The 50 years Sub, the Kermit, the Tuborg, the Maxi Sub, the Vomit Sub, etc. Many words and comments have been made on this watch - it was introduced in 2003 as a 50 yeas anniversary model celebrating that it was in 1953 that the first Rolex Submariner was introduced into the market. In 2003 50 years after the introduction of the first Rolex submariner (some say the first Rolex was introduced in 1954), reference 16610LV was introduced, but has only cosmetic changes to the standard Submariner Date, a green bezel and a "maxi dial" which has larger hour markers. The nick name of the green Submariner has been many, "The Maxi Sub", "The Kermit", "Tuborg watch", "The Vomit Submariner", etc. My guess is that this model has created the most debate in forums around the world from when it was introduced. Almost everybody has an opinion about the model, from love to hate. From the start the talk was if this was a limited model, causing the price on used green subs to be somewhat higher that the official price (like the daytona). But time has shown that this model is included in the normal line of submariner from Rolex. My 16610LV model was brought from local Rolex AD after having being put on the waiting list for about 6-8 months. But then they called - the watch was ready if I still was interested. I left my job early - and got the green sub i its new box without the anchor. But the AD was nice enough to supply me with a Submariner anchor so my Kermit is with the new box and the submariner anchor. The main difference between the 16610LV and the standard 16610 is of cause the green bezel, but the new and very nice change is the introduction of the maxidail and "fatter" hands. This give the watch some of the look of the old vintage submariners where the dots have a nice size, easy to see and somehow give the watch a more pleasant look. The 16610LV has just as many that don't like it as people that love it. But I must say that the added color is a nice touch and the maxi dial is very nice and something I think Rolex will introduce to the other Submariners in the coming years. So far I have only seen one version of the 16610LV, but some people say that their exist two dial versions. 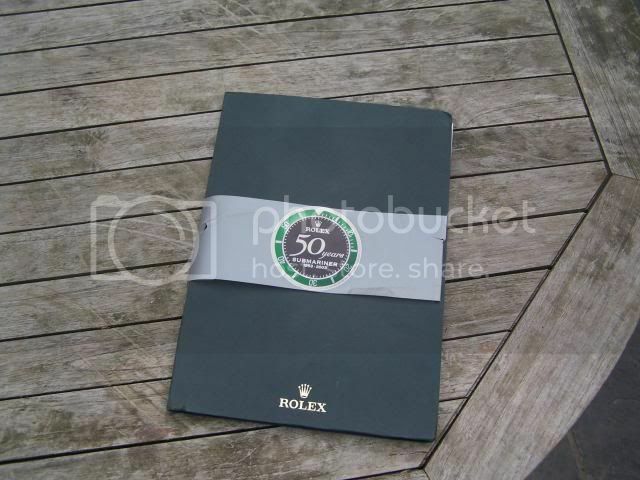 Of cause after Rolex introduced the Rolex engraving on the inside this version is also to be counted as a version.